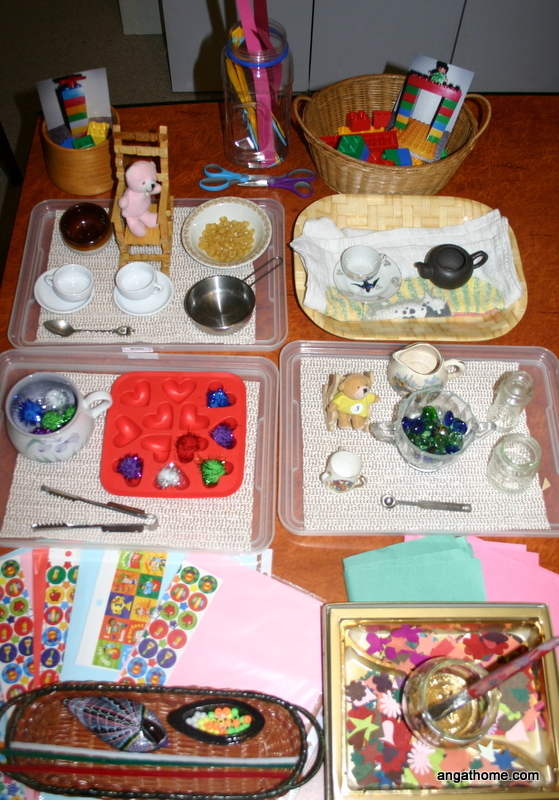 Whether you like to call them Montessori tray activities, tot school, preschool, workboxes, workjobs, shoebox tasks or Ziploc bag activities, providing younger siblings with engaging, educational and worthwhile tasks to do while you homeschool older siblings is vital for a smooth day with well occupied children. While you can get some schooling done while little ones are napping, I prefer to get the bulk of our formal schooling completed as early in the day as possible when the children (and I) are freshest. Last year we had around an hour while the younger ones were in room time (playpen time for littlies) and we could also use mat time (or blanket time.) Now that we have older children though, this is not long enough to complete all of their workload and the twins are turning 3 so a new era has dawned! The twins will be “starting school” with the big kids. They will now be included in our morning circle time, followed by table activities before they go off to room time. The list of possible table activity ideas is almost endless but our “school” trays will be more Montessori in style. As I have done in the past, I have chosen a list of categories for each tray and put one example of each category out on the shelf. When it comes time to update the trays in a couple of weeks as interest declines, I will simply swap out the materials but keep the type of activity the same. (See starting out.) This term our trays are gluing, cutting, stickers and drawing, tong transfer, spooning/teddy play, scooping/teddy play, threading. Duplo copying and water pouring. Whether you are homeschooling or have a young child at school, most of us will at some stage be helping our children learn their letter names and sounds. There are many different ways to do this, from rote learning with flash cards to games and hands on workjob style activities. I use quite a few different methods depending on the child, their rate of learning and preferred learning style and the time I have available to teach them. One of the more hands-on approaches I have employed is an alphabet chart. Again, this is something I made way back in my Uni teacher training days that has been useful through 7 years of teaching and now has made it’s way to the third child in our family. Matching lowercase letters to uppercase letters. lucky dipping letter cards from a pillowslip, naming them, saying their sound and then sliding them into the correct pocket. sorting small objects by their initial sound (first sound you hear when you say the word) into the correct pocket. setting up a word bank system with picture and word cards that begin with each letter “filed” in each pocket for children to use during creative writing. 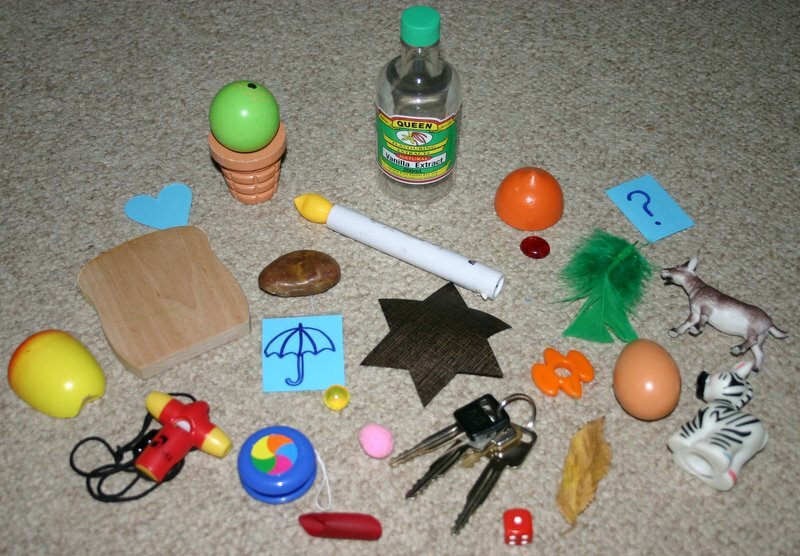 These objects are one set I use for initial sound sorting. 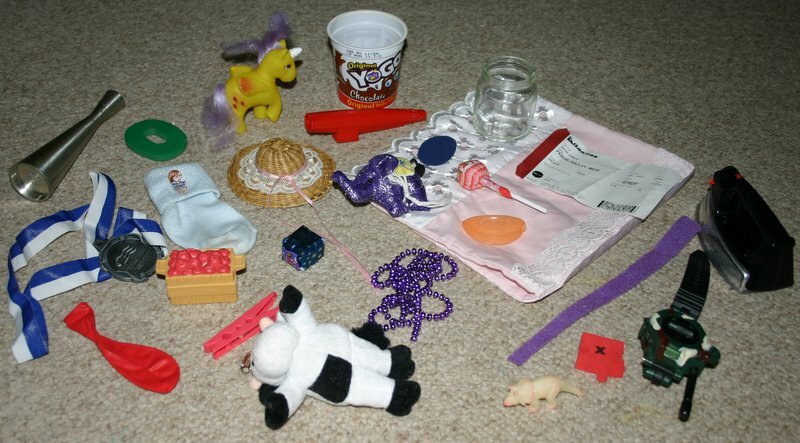 A second set of objects for initial sound sorting. 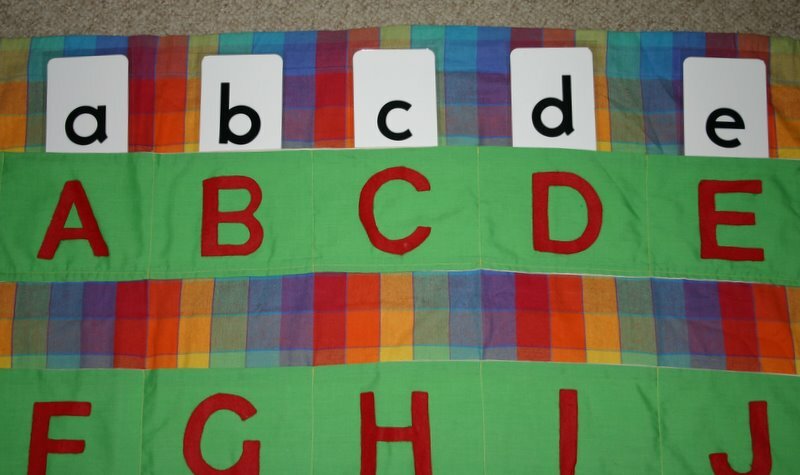 To begin with, all alphabet chart work is done one-on-one with me, however once the child begins to grasp the concept of initial sounds, I give them a bag or box of objects to sort into the correct pocket as an independent activity. It is self-checking because there is never more than one object for each pocket so if they find one already there, they know they have made an error and can self correct. If you are not able to sew a chart, you could make one using cardboard and add Velcro spots to attach the letter cards or large sturdy envelopes to act as pockets for the items. If you plan to use it for any length of time or with more than one sibling it would be worth taking the time to sew one up. It might be a nice project for Grandma perhaps? ?